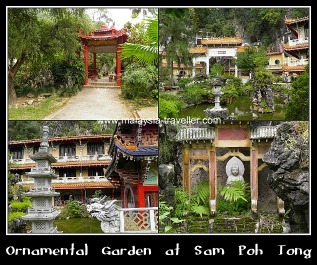 Sam Poh Tong Temple is located at Gunung (Mt.) Rapat on the southern edge of Ipoh. This limestone hill has more holes in it than a Swiss cheese and there is a proliferation of cave temples in the vicinity. According to Lonely Planet's website, Sam Poh Tong is ranked as the 18th best thing to do in Ipoh (out of 33). That does not sound very encouraging does it? Mind you, most of the other 32 things to do on the list are restaurants - Malaysia is a food-obsessed country! 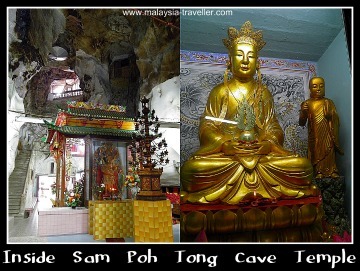 When the restaurants are excluded, Sam Poh Tong scores quite highly but behind Perak Tong, Ipoh's other famous cave temple. I think this assessment is fair. Perak Tong has the more interesting cave interior and provides a good view of the city but Sam Poh Tong has the better gardens. If you only have time to visit one I would recommend Perak Tong. But on the other hand, Sam Poh Tong has other interesting cave temples right next door so you can kill two or more birds with one stone (more on the neighbouring temples later). The story goes that the cave was discovered by a Buddhist monk from China and that he lived there until his death 20 years later. Construction of the temple is said to date from 1912 although the current facade was added in 1950. Sam Poh Tong can be translated as the Cave of Triple Gems but there does not appear to be any explanation of what or where these gems are. Perhaps it is a reference to Buddhist meditation techniques rather than actual jewels. 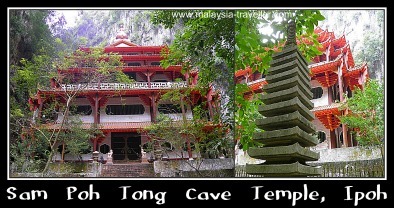 It is said to be the biggest cave temple in Malaysia. This seems doubtful when comparing it to Batu Caves for example. In addition to the Buddhist cave temple, the temple's compound includes a crematorium and a columbarium (which, if you not familiar with the term, is a place for storing the ashes of the departed). Sam Poh Tong's columbarium looks like a 4-storey blue coloured apartment block. This area becomes packed at Ching Ming when relatives pay respects to their ancestors, leaving food and burning paper replicas of items which are of use to the dead in the next world such as fake money, cars, i-Pads, Louis Vuitton bags and so on. Would someone who has been dead for 50 years know how to use an i-Pad I wonder? In front of the temple is a very attractively landscaped garden designed around a large fish pond. Islands on the pond are embellished with artificial rock formations perhaps shaped to resemble the Huang Shan mountains of China. Japanese stone lanterns and pagodas add to the beauty of the garden. An information board says that it was awarded Best Landscaped Garden in Malaysia in 1993. That was a long time ago but the garden still seems to be well looked after. The main altar area is smaller than I expected and filled with statues of Buddha and deities. A staircase leads up to an upper level where there are a few more statues in display cases. Behind a padlocked gate are some steps leading up the hillside but the path seems abandoned and overgrown. Beyond the altar is a passage way leading out to a secluded garden containing the 'tortoise pond' and an ornate pagoda building with red roof tiles. The pond was a disappointment - a fenced-off pool of vivid dark green water surrounded by an assortment of turtles sitting on a drab brick pavement. When volunteers from the Turtle Conservation Centre conducted an inventory in 2009 they counted 265 turtles of 5 different species, all native to Malaysia except for the red-eared slider. They commented that the water was changed irregularly and that the living conditions were rather poor. I purchased a bunch of kangkung (swamp spinach) from a vendor at the entrance and I threw pieces over the fence in the direction of the turtles. They seemed lazy but eventually gobbled down the food. The pagoda building is reminiscent of Buddhist temples in Japan but it was also fenced off and padlocked. The whole area is completely encircled by towering cliffs and there is no exit other than the passageway back into the cave temple. It was a silent and forlorn place, not helped by the fact that I was completely alone there (being a Monday morning there were no other visitors). The only sounds I could hear were the turtles doing belly-flops into the pond and the abundant mosquitoes buzzing near my ears. The temple is marked on the interactive map on my main Caves page. A number of other cave temples are located right next door including Nam Tian Tong and Ling Sen Tong. These are well worth visiting. There is no entrance charge at any of these cave temples although it is customary to drop some money in the donation boxes.